Frame advancing is a commonly used TAS feature which basically means running the game frame by frame. TASers use this feature to press exact buttons at the exact frames. This commit added frame advancing to the framelimiter and two actions to the Movie menu. The default hotkey is \ for advancing frames, and Ctrl+A for toggling frame advancing. The Advance Frame hotkey would automatically enable frame advancing if not already enabled. Frame advancing is a commonly used TAS feature which basically means running the game frame by frame. TASers use this feature to press exact buttons at the exact frames. 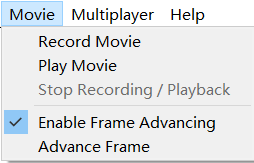 This commit added frame advancing to the framelimiter and two actions to the Movie menu. The default hotkey is `\` for advancing frames, and `Ctrl+A` for toggling frame advancing. The `Advance Frame` hotkey would automatically enable frame advancing if not already enabled. First of all, thanks a lot for this PR! It is fantastic and works great! @Real96 I'm not really sure about that. Some people might want to "continue" the game without cancelling frame advancing, and this would pretty much surprise them and probably ruin their runs as well. @Real96 Well, some people might just intentionally / accidentally press Pause. with Continue = Continue + Cancel Frame Advance they won't be able to return to the previous state (Game running + Frame Advance) without losing frames anymore. Oh, ok that's why then. Anyway it is perfect as it is! Thanks a lot for this!